Add some zing to your chicken meatballs and make a homemade kung pao sauce with 100% clean eating ingredients! Everyone will love these Kung Pao Baked Chicken Meatballs either as an appetizer or served over white sticky rice with a vegetable. So I have officially given every reason for the world to believe I have a ball fetish. Over the past few months, more than 5 recipes have been ball recipes. I’m rolling with it because I think it’s high.larious. And…I sort of do have a ball fetish. Ask my freezer. It’s home to at least 50 energy balls at a time. Yup, they need to be added to your list of things to make ASAP. Remember FFF’s Healthy Kung Pao Chicken that went up a few years ago? Well, we based this sauce off of that very recipe. Why? Because it’s gotten rave reviews from so many FFF readers, we thought we’d re-invent it with an amazing baked chicken meatballs recipe! You can easily keep these flavorful kung pao meatballs gluten-free by using a gluten-free flour blend and certified gluten-free rolled oats. We love the texture rolled oats give these baked meatballs and I’m sure you will too! 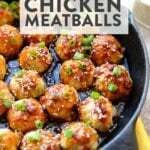 Baked Chicken Meatballs – not fried! You read that correctly that these meatballs are baked, not fried! 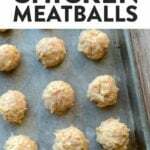 We loved making baked chicken meatballs as opposed to pan-fried because there is so much less of a mess. Insert so much oil splatter all over your stove-top. No thank you! 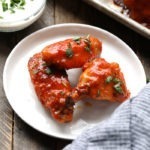 For this, you’ll need a baking sheet or a cast iron skillet that you can pop in the oven. Once you’ve got your meatballs in the oven, it’s time to make the kung pao sauce! Now, I’m sort of biased about Fit Foodie’s kung pao sauce, but it’s pretty damn good! I love it mostly because it’s made with honey and not another refined sugar. It’s also super basic with just 5 total ingredients. Is our kung pao sauce spicy? I would say it’s medium or…Minnesota spicy? You can totally control the spice by adding more soy sauce and/or honey! First, preheat oven to 400ºF and spray a baking sheet with coconut oil cooking spray. Set aside. Next, prep chicken meatballs mixture by placing all ingredients into a large bowl and mixing until combined. Using a tablespoon cookie scoop (note: these are bite-sized, not giant! ), scoop out a heaping scoop of mixture and mold into a ball with your hands. It works best if your hands are slightly wet with water. Place on baking sheet and repeat. Bake meatballs at 400ºF for 25-28 minutes or until the top begins to turn golden brown. While the meatballs are cooking, prep the kung pao sauce, by mixing all ingredients together in a small bowl. Once the meatballs have slightly cooled, toss in sauce. Serve hot!